A cross section through the ear is illustrated in Figure 11-1. The external ear consists of the pinna and the external auditory canal. The pinna is composed of elastic cartilage and skin. Figure 11-2 illustrates the parts of the pinna. Figure 11-1 Cross-sectional view through the ear. Figure 11-2 Landmarks of the pinna. 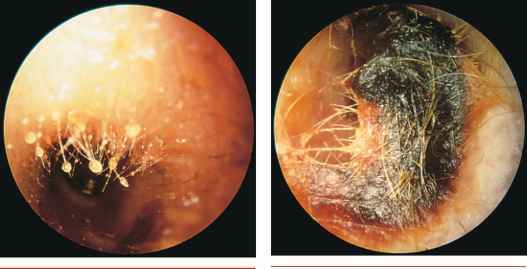 Figure 11-3 Earwax on the base of hairs. Figure 11-4 Earwax in the external ear canal. The middle ear, or tympanic cavity, consists of connections to the mastoid antrum and to its connecting air cells and, through the eustachian tube, to the nasopharynx. The function of the eustachian tube is to provide an air passage from the nasopharynx to the ear to equalize pressure on both sides of the tympanic membrane. The eustachian tube is normally closed but opens during swallowing and yawning. The tympanic membrane forms the lateral boundary of the middle ear. The medial boundary is formed by the cochlea. The tympanic membrane is gray, with blood vessels at its periphery. It is composed of two parts: the pars flaccida and the pars tensa. The pars flaccida is the upper, smaller portion of the tympanic membrane. 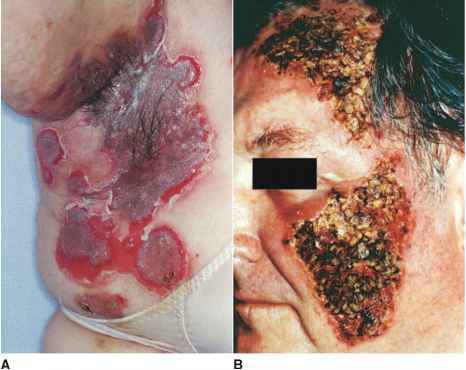 The pars tensa comprises the remainder of the membrane. The handle of the malleus is a prominent landmark and divides the pars tensa into the anterior and posterior folds. The tympanic membrane is set slightly at an angle to the external canal. The inferior portion is more medial than is the superior portion. Figure 11-5 illustrates the left tympanic membrane. 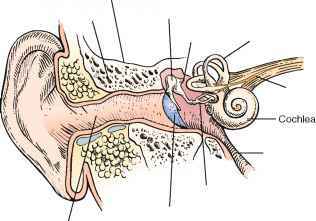 Sound is conducted from the tympanic membrane to the inner ear by three auditory ossicles: the malleus, the incus, and the stapes. The malleus is the largest ossicle. At its upper end is the short process, which appears as a tiny knob. The handle (long process) of the malleus, or manubrium, extends downward to its tip, called the umbo. The short process and the handle of the malleus attach directly to the tympanic membrane. At the other end of the malleus is its head, which articulates with the incus. The incus then articulates with the head of the stapes, the footplate of which attaches to the oval window of the inner ear. 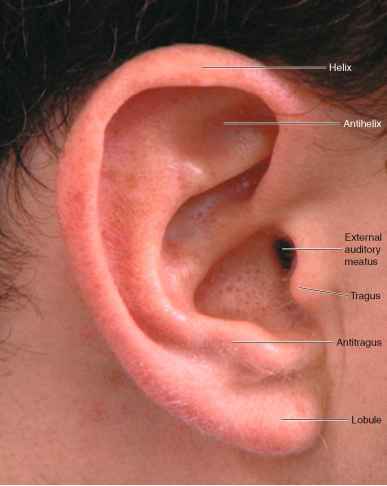 The middle ear also contains two muscles: the tensor tympani and the stapedius. The tensor tympani muscle attaches to the malleus, and the stapedius muscle attaches to the neck of the stapes. The tensor tympani muscle is innervated by the trigeminal nerve, and the stapedius muscle is innervated by the facial, or seventh cranial, nerve. Both muscles contract in response to high-intensity sound. *On occasion, when the distal external canal is cleaned, coughing may result. This cough reflex is mediated through the vagus nerve. Figure 11-6 Cross-sectional view through the cochlea.